Curtains is crocheted in a style known traditionally as filet crochet. At one time, it was commonly used for curtains, table linens and women’s clothing. It was also fairly common to include text in filet crocheted pieces, which is easily rendered in this style. 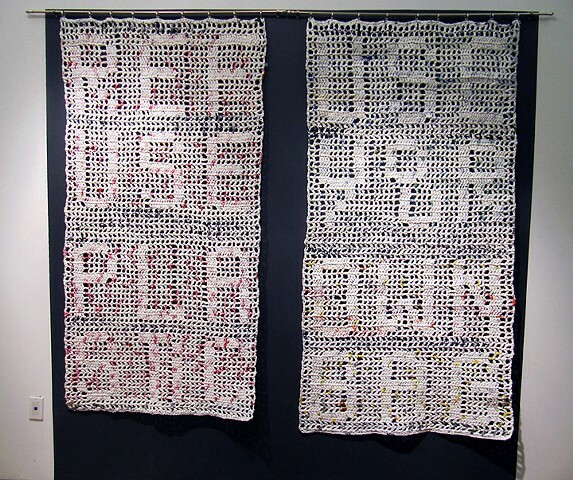 Curtains is intended as a public art piece, the messages reading: REFUSE PLASTIC and USE YOUR OWN BAG. It is the first time I have so clearly stated this point in my work, having relied primarily on the medium as the message. I am concerned that plastic bags represent a serious ecological threat and I use this work to call attention to that threat. At first glance the piece appears to be an attractive piece of crochet work. It is not until one steps away from it that the words become visible. One must spend a moment studying it to read its message and understand that the title is also part of the piece.